In total they appeared together in 107 films including 40 short sound films, 32 silent films and 23 full-length feature films, and made 12 guest or cameo appearances, including the recently discovered Galaxy of Stars promotional film (1936). Their silent film Big Business (1929) was added to the Library of Congress as a national treasure in 1992. 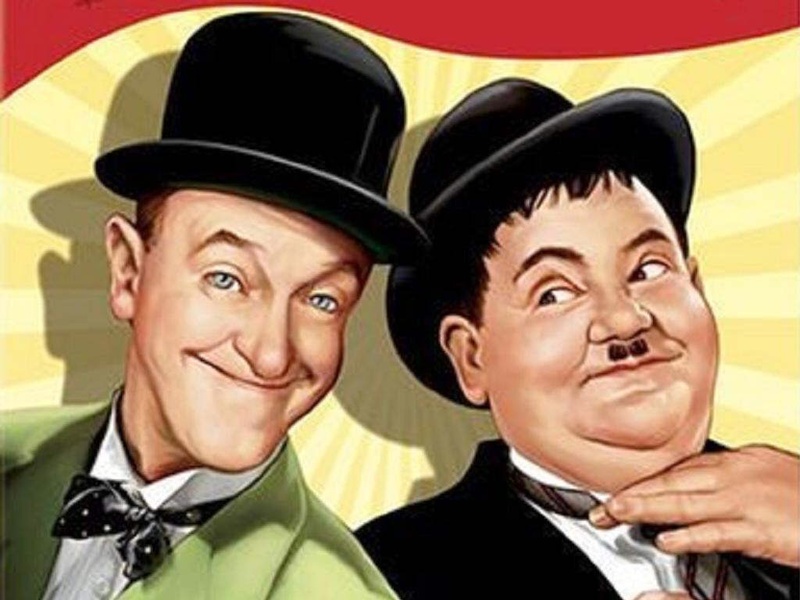 The works of Laurel and Hardy have been re-released in numerous theatrical reissues, television revivals, 16mm and 8mm home movies, feature-film compilations, and home videos since the 1930s. They were voted the seventh greatest comedy act in a 2005 UK poll by fellow comedians. The duo’s signature tune, known variously as “The Cuckoo Song”, “Ku-Ku”, or “The Dance of the Cuckoos”, played on the opening credits of their films. The official Laurel and Hardy appreciation society is known as The Sons of thE Desert after the film of the same name. Bruce Dickinson lead Singer with Iron Maiden was born August 7 1958 in Worksop Nottinghamshire. Dickinson started school at Manton Primary in Worksop, when he was six, he was also despatched to Sheffield,where he attended a primary school in Manor Top. six months, his parents decided to move him to a small private school called Sharrow Vale Junior. Dickinson’s first musical experience was dancing in his grandparents’ front room to Chubby Checker’s “The Twist”, when he still lived with them in Worksop.The first record Dickinson recalls owning was The Beatles single “She Loves You”, which he managed to persuade his grandfather to buy him, which made him more interested in music.He tried to play an acoustic guitar belonging to his father, but it blistered his fingers. He then went to school at Oundle, where Despite being bullied, he rose to a position of some power in the school’s cadet force,with which he was allowed to handle live ammunition, which he used to create explosions as booby-traps. he also co-founded the school wargames society with Mike Jordan. while at Oundle Dickinson became attracted to hard rock, after hearing Deep Purple’s “Child In Time” being played in another student’s room. As a result, the first album he ever bought was Deep Purple’s In Rock, which created his interest in rock music. After In Rock, he went on to buy Black Sabbath’s debut, Jethro Tull’s Aqualung and Tarkus by Emerson, Lake & Palmer. Every term, a band would play at the school, the first of these which Dickinson saw was called Wild Turkey, featuring former Jethro Tull bassist Glenn Cornick. After that, he saw Van der Graaf Generator and Arthur Brown. Dickinson was eventually expelled from Oundle after urinating in the headmaster’s dinner. Returning home to Sheffield in 1976, Dickinson enrolled at a local comprehensive school, at which he joined his first band.He had overheard two other pupils talking about their band and that they needed a singer and so volunteered immediately. Their first gig took place at the Broadfield Tavern in Sheffield.Originally called “Paradox”, the band changed their name on Dickinson’s suggestion to “Styx”, unaware of the American act with the same name.They made local newspaper headlines when a steel worker was awoken by their performance and tried to smash the band’s drum kit. Soon afterwards the band split up. After leaving school with A-levels in English, History and Economics, Dickinson confessed, “I didn’t really know what I wanted to do.”The first thing he did was join the Territorial Army for six months. Although he enjoyed his time in the TA, Dickinson realised that it was not a career choice, and so he applied for a place to read history at Queen Mary College, in London’s East End. His parents wanted him in the army, but he told them that he wanted to get a degree first, which acted as his “cover story”, and immediately began playing in bands. At university, Dickinson got involved in the Entertainments Committee: “one day you’d be a roadie for The Jam, the next you’d be putting up the Stonehenge backdrop for Hawkwind or whatever.”In 1977, Dickinson met Paul “Noddy” White, a multi-instrumentalist who owned a PA and other equipment, with whom Dickinson, along with drummer Steve Jones, would form a band together called Speed. According to Dickinson, the band was called Speed because of the way in which they played, rather than a reference to drug-taking. In Speed, Dickinson began writing his own material after White taught him how to play three chords on the guitar. He also began fronting small pub bands while attending school in Sheffield and university in London and spotted an advertisement in Melody Maker with the caption “Singer wanted for recording project” and replied immediately recording a demo tape and sending it They liked it and invited Dickinson down to the studio to make “Dracula”, the first song he would ever record, he subsequently joined a band called “Shots”, which was formed by two brothers, Phil and Doug Siviter and regularly played at Pubs. One particular night, Dickinson suddenly stopped in the middle of a song and started interviewing a man in the audience, heckling for not paying enough attention. He got such a good response he started doing it every night until it became a regular routine. Dickinson was invited by Barry Graham (“Thunderstick”) and Paul Samson to be their new singer. Dickinson joined once he’d finished taking his History finals two weeks later. Until that point, he had been neglecting his University education. As a result, the University had tried to kick him out for failing his Second Year exams and not paying his accommodation fees, but was saved because of his role as Entertainments Officer. After writing 6 months worth of essays in the space of two weeks and some last minute cramming for his exams, Dickinson achieved a 2:2. In 1979, he joined the New Wave of British Heavy Metal band Samson, with whom he gained some popularity under the stage name “Bruce Bruce” and performed on two studio records. During these early rehearsals the nickname “Bruce Bruce” was used, derived from Monty Python’s “Bruces sketch”. Dickinson debuted on their 1982 album The Number of the Beast. Iron Maiden’s third album, The Number of the Beast, was released in 1982 for which Dickinson contributed to “The Prisoner”, “Children of the Damned” and “Run to the Hills”. Dickinson also contributed On the following albums, 1983’s Piece of Mind and 1984’s Powerslave, on the singles “Flight of Icarus” and “2 Minutes to Midnight”. In 1985 Iron Maiden released their next album, Somewhere in Time. Iron Maiden’s next album Seventh Son of a Seventh Son, featured more progressive rock elements for which Dickinson wrote seven songs. Adrian Smith then left Iron Maiden, and was replaced by Janick Gers and In 1990 Iron Maiden released their eighth album No Prayer for the Dying. Which featured Dickinson’s song “Bring Your Daughter… to the Slaughter”, Which was composed for a film soundtrack, and despite receiving a Golden Raspberry Award for worst original song in 1989, became a Number One single. By 1992, Steve Harris had converted his barn into a proper studio, and it was here they recorded Iron Maiden’s new album, Fear of the Dark. After the Fear of the Dark Tour, Dickinson decided to leave Iron Maiden to concentrate on his solo career. Tensions increased within the band and Dickinson’s last performance with the band was filmed by the BBC at Pinewood Studios which was released as a live video, entitled Raising Hell. Dickinson quit Iron Maiden in 1993 (being replaced by Blaze Bayley) in order to pursue his solo career, which saw him experiment with a wide variety of heavy metal and rock styles. In 1999 Dickinson returned to Iron Maiden along with Adrian Smith while Janick Gers remained in Iron Maiden for the Final Frontier World Tour. They also recorded the album Brave New World at Guillaume Tell Studios, Paris after which Iron Maiden undertook a supporting tour culminating with a performance at the Rock in Rio festival before a crowd of 250,000. In 2003 they released the album Dance of Death. Iron Maiden’s next album A Matter of Life and Death was recorded in 2006. Since his return to Iron Maiden, he issued one further solo record in 2005, Tyranny of Souls. His younger cousin, Rob Dickinson, is the former lead singer of British alternative rock band Catherine Wheel, while his son, Austin, fronted the metalcore band Rise to Remain. Between 2008 and 2009, the band embarked on the Somewhere Back in Time World Tour, using Ed Force One, the band’s customised Boeing 757, flown by Dickinson himself. 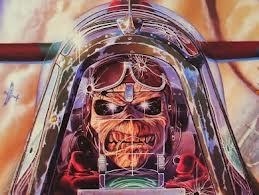 This was accompanied in 2009 by the documentary film Iron Maiden: Flight 666. Iron Maiden toured again in 2010 and 2011 in support of The Final Frontier. In 2005, Iron Maiden co-headlined the US festival tour, Ozzfest, with Black Sabbath. Unfortunately though Lead singer Ozzy Osbourne’s wife, Sharon, encouraged family friends and members of other bands to sabotage Iron Maiden’s last performance at Hyundai Pavilion in San Bernardino, California, After it was reported that Dickinson had slated the Osbournes’ reality series. However Dickinson denied making comments against Ozzy Osbourne and Black Sabbath, but admitted that he criticised Ozzfest, attacking their “corporate” seating layout and the fact that “Most of the bands are there because they paid to be there.” Following the concert at San Bernardino, Osbourne released another statement which accused Dickinson of making several anti-American comments, Osbourne also claimed that the flag-waving during “The Trooper” was disrespectful to American troops, even though Dickinson had always held a Union Flag during the song, being based on the Battle of Balaclava during the Crimean War. In early 1989, Dickinson was asked to produce a track for the movie A Nightmare on Elm Street 5: The Dream Child resulting in the song “Bring Your Daughter to the Slaughter”. Dickinson also participated on a re-recording of Deep Purple’s “Smoke on the Water”, as part of the humanitarian effort Rock Aid Armenia. Backed by the band Skin, he produced a cover version of Alice Cooper’s “Elected”, along with Rowan Atkinson (in character as Mr. Bean), which was used in 1992 for Comic Relief, and five years later, on the Bean Soundtrack. Iron Maiden are Considered one of the most successful heavy metal bands in history and won the Ivor Novello Award for international achievement in 2002, and were also inducted into the Hollywood Rock Walk in Sunset Boulevard, Los Angeles, California during their United States tour in 2005. As of August 2011, the band have played almost 2000 live shows throughout their career. For the past 30 years, the band have been supported by their famous mascot, “Eddie”, who has appeared on almost all of their album and single covers, as well as in their live shows. Since their inception, the band’s discography has grown to include a total of thirty-six albums: fifteen studio albums; ten live albums; four EPs; and seven compilations. Dickinson is also well known for his wide variety of other pursuits. He was also a commercial pilot for Astraeus Airlines, and captained Iron Maiden’s converted Boeing 757 (Ed Force One) during many world tours. Following Astraeus’ closure, he created his own aircraft maintenance and pilot training company in 2012, Cardiff Aviation. Dickinson presented his own radio show on BBC Radio 6 Music from 2002–2010, and has also hosted television documentaries, authored novels and film scripts, created a successful beer with Robinsons Brewery and competed at fencing internationally.